We’re hoping you remember the cool Olive Bistro folks at Cyber Hub. So, they’ve got a new all-day cafe that’s going to be homey, quiet and just the spot for conversations and coffee. Say hello to the adorably named, Olly. 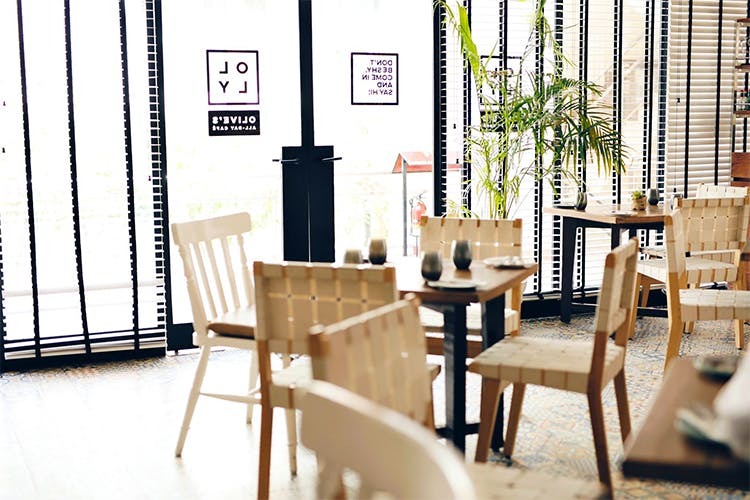 Soft ambient music, greens on every table, artworks that you can buy and artisanal coffee… There’s literally every reason to get excited about Olly. They are hoping to become everyone’s home away from home in an area that’s come to be synonymous with hurried office-goers. And, we really hope they all find respite from those Excel sheets and manic meetings over salads and pizzas. With separate menus for morning brews, breakfast, brunch (that ends at 5pm), coffee and dinner, they’ve got a fun selection to choose from. Yes, they’re a little partial to clean eaters with their picture-perfect salads and calorie-light smoothies, but hey, they want to make sure you don’t miss Olive Bistro, so there’s pasta too. Their love for coffee borders on obsession. They source their beans from single estates and have different grinds to offer. Even when you pick the French press, they’ve got a fruity or a sharp flavour to pick from. So, if you don’t share the same enthusiasm, you can stick to cold-pressed juices or, better still, their house cocktails (some of them come in bottles!). This apart, we’re pretty kicked at getting that table plant home (yes, those little greens are all up for sale). Want to know what they’re up to during the week? Stalk them on Instagram (OMG, those photos be killin’ us softly). Just a few months old, this baby of Olive is our newest crush. It's a soothing space to grab our perfect cup of coffee while shopping for a greener home on the side.